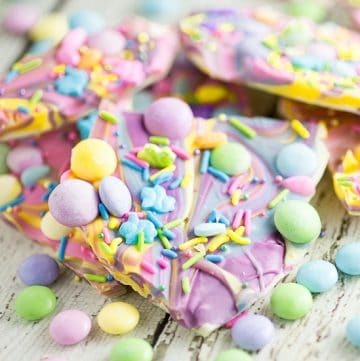 Quick and easy Chocolate Easter Bark is a simple but festive spring treat featuring milk and white chocolate swirled together and topped with Easter candy favorites and sprinkles. 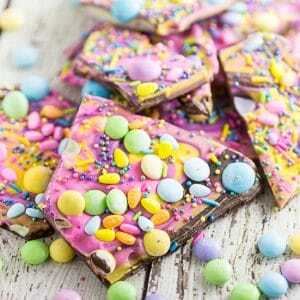 This Chocolate Easter Bark is creamy, sweet, and delicious, but best of all it’s fast and easy. 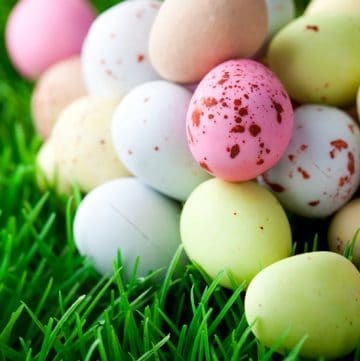 It features a layer of smooth milk chocolate (or dark, if you prefer) topped with swirls of creamy white chocolate topped with your favorite Easter candies. SO easy, SO fun, and oh-SO-good! My kids love to help make this recipe too. And it’s so easy they can almost make it themselves! I have them man the microwave, stir the chocolate, and sprinkle on their favorite sprinkles and candies. They love it. 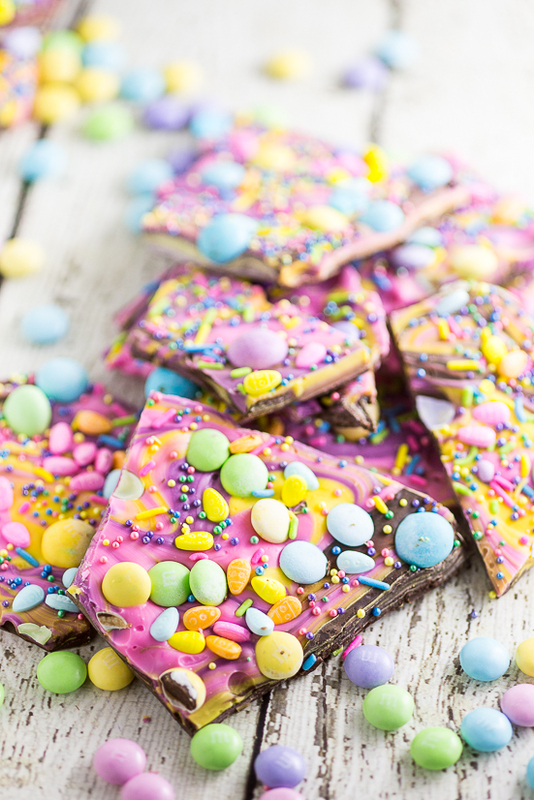 Chocolate Easter bark is perfect for a last minute holiday treat. No need to make the holidays more stressful than they have to be, right? I even took the extra couple minutes to make an Amazon shopping list below so you can get everything you need right from your phone. Yay! Step 1: Line a large baking sheet with wax paper or with a silicone mat. Set aside. Step 2: Place milk chocolate in a microwave-safe bowl. Microwave in 30 second intervals, stirring after each 30 seconds, until chocolate is totally melted and smooth. Set aside. 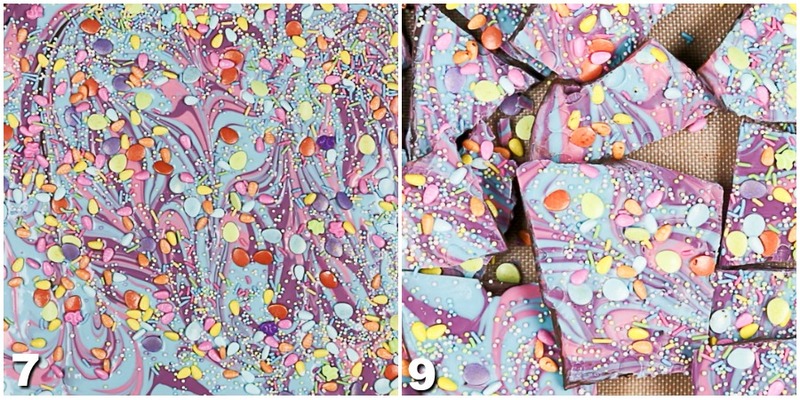 Step 3: Repeat the 30 second interval melting process for each candy melt color. Add bits of white chocolate to each to make the colors pastel. Set aside when done. Step 4: Pour melted milk chocolate onto the lined baking sheet. Spread evenly. Step 5: Scoop melted candy melts into dollops, one color at a time on top of the milk chocolate. Leave it in glops for this step (It won’t look swirled yet). Step 6: When all chocolate and candy melts are in the baking sheet, swirl together with a butter knife or toothpick. Place the tip of the knife all the way to the bottom of the baking sheet and gently swirl up and down, back and forth, or diagonally until you achieve your desired look. Step 7: Sprinkle Easter candies and sprinkles on top. Step 8: Let set for an hour, or until hard and solid. Step 9: Break into pieces once set. Store in an air tight container in a cool dry place. My biggest most important tip for making this recipe is that you only microwave in 30 second intervals, and you stir between each one. Otherwise, your chocolate will seize up and get stiff, and you’ll have to throw it away and start over. Be careful not to over heat the chocolate. You want to microwave it the least amount possible. Stir a lot to get it to melt faster, and as soon as it’s melted set aside. Feel free to substitute dark chocolate for milk chocolate, if you prefer! For best tasting bark, use high quality chocolate bars, such as Lindt or Ghirardelli instead of baking chips. What kind of candy do you use? This is the fun part! You can use any of your favorites. 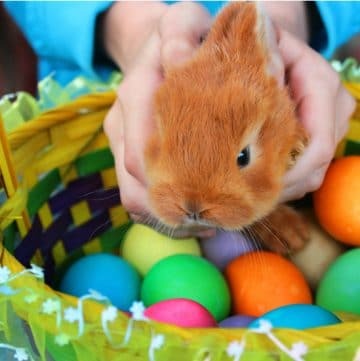 Cadbury eggs, robin eggs, M&M’s, Reese’s eggs… Possibilities are endless! To get the bark to set faster, you can place it in the refrigerator or freezer. However, this can sometimes affect the coloring of the M&M’s and chocolate. Instead of shiny, they will look a little matte. If thal ft doesn’t bother you, then go for it! Store bark in an airtight container in a cool dry place at room temperature or in the refrigerator for up to 3 weeks. For longer storage, bark can be frozen for up to 2 months. Thaw overnight in the refrigerator to serve. 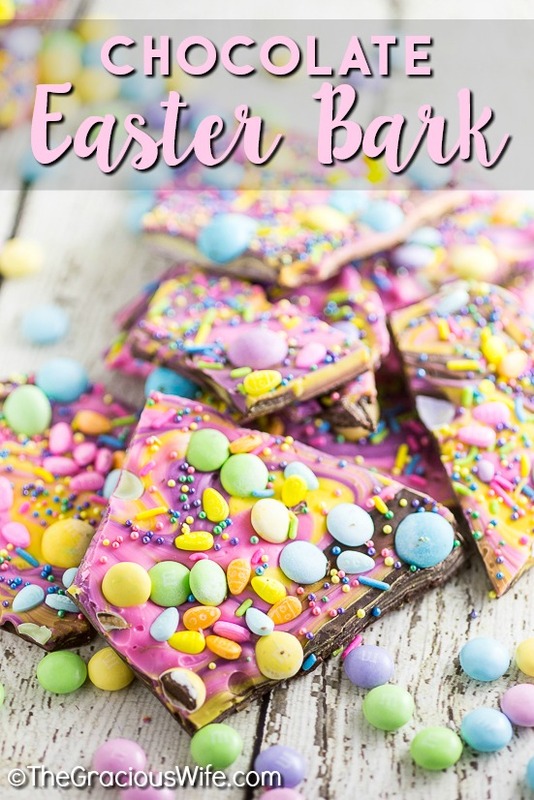 If you love white chocolate more than milk chocolate, you can check out this white chocolate Easter Bark version that I shared last year. Bunny Cinnamon Rolls – perfect for Easter morning! Carrot Cake Roll – an Easter favorite with a twist! Easter Egg Rice Krispie Treats – quick and easy! Carrot Cake Cupcakes – THE BEST EVER! Carrot Cake Donuts – baked with cream cheese frosting! 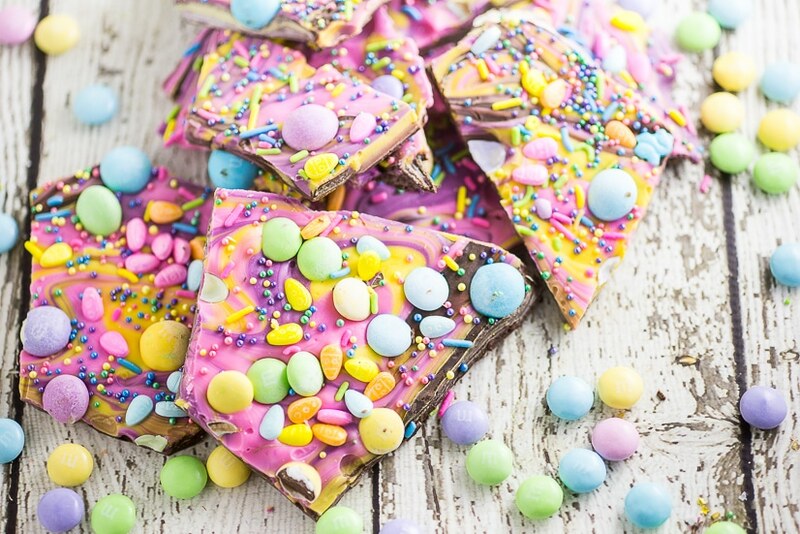 Chocolate Easter Bark is a simple, festive, spring treat featuring two kinds of chocolate swirled together and topped with M&M’s, chocolate eggs, and sprinkles! 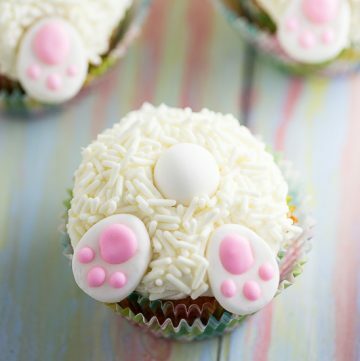 The pastel colors, fun sprinkles, and candy make this a super fun and festive no bake Easter treat for kids! Line a baking sheet with wax paper or a silicone mat. Set aside. Melt milk chocolate in a microwave-safe bowl in the microwave in 30 second intervals, stirring between each interval to prevent chocolate from burning. Set aside. 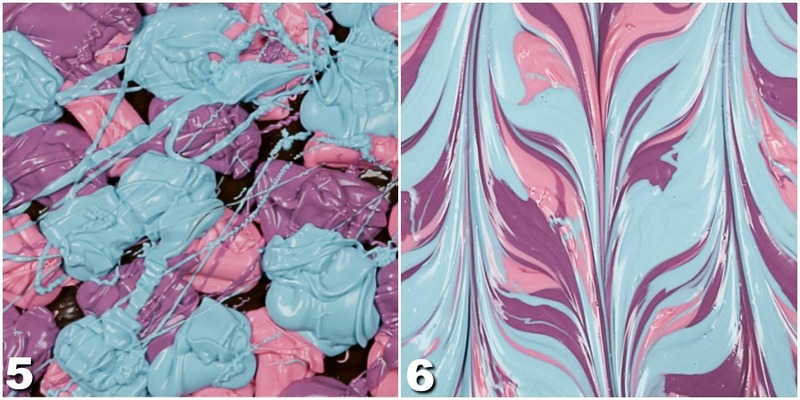 Repeat melting process in a separate microwave-safe bowl for each color of candy melts (each color needs its own bowl). Add bits of white chocolate to make the colors more pastel. Set aside. Pour melted milk chocolate onto the lined baking sheet. Spread evenly. Scoop melted candy melts into dollops, one color at a time, on top of plain chocolate. Just leave it in glops for now. When all chocolate is in the pan, swirl together with the tip of a butter knife to get the marbling effect. Just place the knife tip all the way to the bottom of the sheet and gently swirl up and down, back and forth, or diagonally, until you achieve your desired look. Sprinkle M&M’s and sprinkles on top. Let set for an hour, or until hard and solid. You can also place in the refrigerator or freezer to help set faster (see note at bottom of recipe). Break into pieces once set. It should make about 18 medium pieces. To get the bark to set faster, you can place it in the refrigerator or freezer. However, this can sometimes affect the coloring of the M&M’s and chocolate. Instead of shiny, they will look a little matte. If that doesn’t bother you, then go for it!